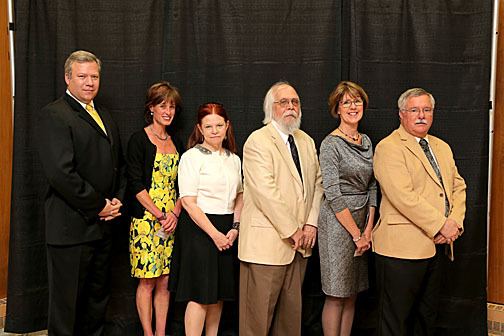 UT outstanding advisers, researchers and teachers, and recipients of the Edith Rathbun Award for Outreach and Engagement, were recognized last week. 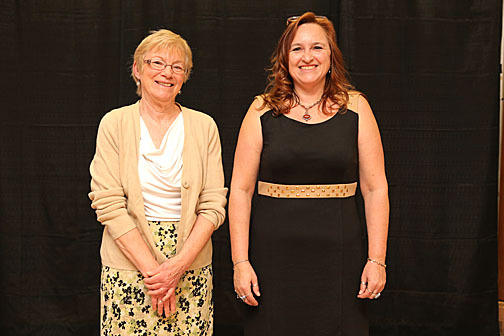 Dr. Lynn Bachelor, left, and Adrienne Aguilar won Outstanding Adviser Awards. Adrienne Aguilar, program manager of computer science and engineering in the UT College of Engineering at Lorain County Community College in Elyria, Ohio. She has worked at the University since 2001. Dr. Lynn Bachelor, associate professor of political science and public administration, and director of the Master of Public Administration Program, in the College of Languages, Literature and Social Sciences. She joined the UT faculty in 1988. 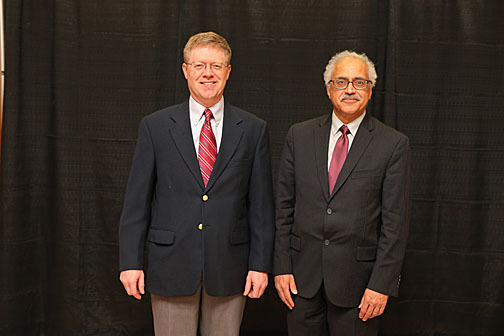 Outstanding Researcher Awards went to Dr. Tim Fisher, left, and Dr. Abdollah Afjeh. Dr. Abdollah Afjeh, professor and chair of the Department of Mechanical, Industrial and Manufacturing Engineering in theCollege of Engineering. He joined the UT faculty in 1984.
mechanical systems, particularly rotating systems. Afjeh has been the principal investigator of 37 research grants and has received more than $18 million in sponsored research. These grants have allowed him to establish computational and experimental research facilities at UT. Dr. Tim Fisher, professor and chair of environmental sciences in the College of Natural Sciences and Mathematics. He joined the University in 2003. He studies landscape evolution during the Quaternary Period, the last 2.6 million years of Earth’s history with a focus on geologic events that occurred during the last glaciation up to modern time. Fisher’s fieldwork activities are conducted in southern Canada, the Midwest and the Great Lakes region. Dr. Todd Crail, left, and Dr. Sonny Ariss received the Edith Rathbun Award for Outreach and Engagement. Dr. Sonny Ariss, professor and chair of management in the College of Business and Innovation. He joined the UT faculty in 1985. Dr. Todd Crail, lecturer in environmental sciences in the College of Natural Sciences and Mathematics. He became a lecturer in 2012 and was a teaching assistant/research assistant at the Lake Erie Research Center and UT since 2005. 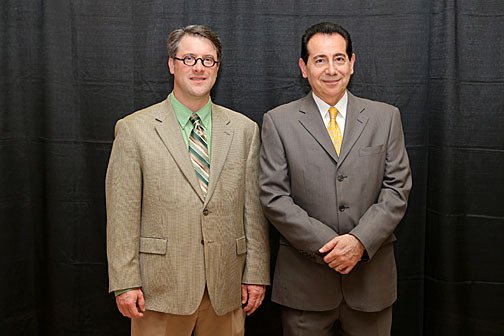 The Outstanding Teacher Awards went to, from left, Dr. John Laux, Dr. Page Armstrong, Dr. Sara Lundquist, Dr. David Guip, Dr. Carol Bennett-Clarke and Dr. Robert McCollough. Dr. Page Armstrong, lecturer in the Jesup W. Scott Honors College. She has been teaching at the University since 2001. Dr. Carol Bennett-Clarke, professor of neurosciences and associate dean for preclinical undergraduate medical education in the College of Medicine and Life Sciences. She joined the faculty in 1991. Dr. David Guip, professor of art in the College of Communication and the Arts. He began teaching at UT in 1972. Dr. John Laux, professor and chair of the School of Psychology, Higher Education and Counselor Education in the College of Social Justice and Human Service. He joined the UT faculty in 2001. Dr. Sara Lundquist, associate professor and chair of English language and literature in the College of Languages, Literature and Social Sciences. She started teaching at the University in 1993. Robert McCollough, lecturer in history in the College of Languages, Literature and Social Sciences. Col. McCullough, a former fighter pilot, joined the UT faculty in 1992. This entry was posted on Thursday, May 1st, 2014 at 3:57 am and is filed under Alumni, Arts, Business and Innovation, Engineering, Honors, Languages, Literature and Social Sciences, Medicine and Life Sciences, Natural Sciences and Mathematics, News, Research, UT Health, UToday, — Communication and the Arts, — Social Justice and Human Service .